We all learn differently and at different paces. Making the classroom adaptable for every personality type can be challenge! I chat with Mandy Rice, a high school teacher by day and a side hustler at night! Mandy ‘flipped’ her classroom by providing her students with video tutorials to watch before class. Students use class time to practice and participate – cutting their learning time and outperforming their peers. Wow! 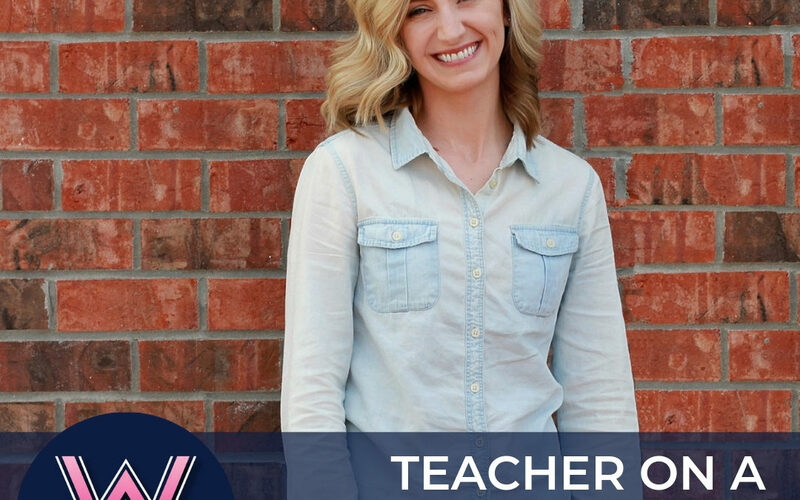 Mandy is always looking for ways to use her love for teaching to make a meaningful impact on her profession. After all, the riches are in the niches! Mandy’s teaching job and her side hustle. Her side hustle is born from her desire of teaching. Exploring ways to inspire, share and collaborate in the education space. Working with teachers to assist in their personal development. Side hustles allow you to build different skill-sets that bring confidence and energy to continue your journey. Mandy’s WHY is adding value to other teachers while finding a balance to raise small children. The concept of the “flipped classroom” vs. direct instruction. Online course creates the instruction and doing the guided practice in the classroom. You want the teacher to guide while practicing! The outcome is better learning and better scores. Flipping classroom concept allows for different learning preferences. There is no embarrassment in hitting the ‘pause’ button. Teachers pay teachers for pre-created content. The riches in the niches! Peaking your performance for your students. Content is NOT king but building relationships with your students. Marketing yourself is building a community that shares your ideas. Check out Mandy’s Instagram, Facebook and blog. Lisa Linfield: 00:21 Hello everybody and welcome to Working Women’s Wealth. Today, I’m joined by a fantastic teacher who is going to teach me a lot about the world of teaching, which I’m just so excited and can’t wait to learn and kind of update myself on the new ways of work. I don’t know about most of us, but for me definitely there wasn’t computers in every classroom when I went to school. So Mandy, thank you so much for joining us on today’s episode. Mandy Rice: 00:47 Yes, thank you. Thanks Lisa so much for having me, I’m really excited. Lisa Linfield: 00:51 So tell us about your day job. Mandy Rice: 00:54 Yeah, so I live just outside of Cincinnati, Ohio in the states, and I teach in a high school. So it’s a ninth through 12th grade building and I’m certified in social studies. I teach four classes of American history to sophomores, that’s 10th grade. And then I teach two classes of AP psychology to 11th and 12th graders, so that’s kind of more like a college prep, they got a big test at the end to get them college credit. I’ve been doing that for almost 10 years now and yeah, I’m kind of born and bred to be a teacher I guess you could say. Lisa Linfield: 01:30 And what does the AP standpoint in AP psychology? Mandy Rice: 01:34 Oh good, thank you. Yeah, so it stands for advanced placement and the company is called College Board. They have a huge program that’s really popular where students take a course taught in high school, and then at the end they take the AP exam, the advanced placement exam, and it scored on a scale of one to five and most places or most colleges, universities will accept a three and give them college credit for that. But then the more prestigious places will be a four or a five, so we’ve got our exam coming up on May 9th so we’re just working with all 50 of my students to get them prepared for that. Lisa Linfield: 02:11 So in your day job you teach kids and prepare for the lessons and do all of that and you’ve now started as side hustle. Tell me a little bit about how you got into your first side hustle. Mandy Rice: 02:24 Okay. Yeah, that’s a big one. So I have always been, I guess the overachiever, I’ve always had this, I don’t know how to put it into words, but almost like a desire not for more necessarily but kind of like for all the things, like I like to have lots of things going on at one time. I guess that’s FOMO, right? Like the fear of missing out. I mean, I’ve done quite a few things, like I sold makeup before. One of my recent ones was that I sold children’s books, which actually fit really well with my life because I’m a mom of three, but I also am an education, right? So reading in children’s books, I have a very, very big passion for. So I still kind of do that here and there but then my most recent one is one that I’m probably the most passionate about, it’s one that I’ve been working in for 10 years as a teacher. It’s one that really where my heart is and where my college education is, you can never doubt that. Right? Like I’ve spent so many years preparing and I don’t want to underestimate myself when it comes to that. So I actually just started a company in January, so it’s still a baby company, teach on a mission is what I’ve called it. And the idea is that I want to work with other teachers, I want to reach out to other teachers and help them really build up themselves, I guess, it’s almost like personal development for teachers, understanding the power that you have in reaching students on a daily basis. And my first adventure is going to be in helping teachers build a flipped classroom. Lisa Linfield: 03:54 Before we get to that, what fascinates me about your journey, you know with each of your different side hustles, so the makeup to the kids’ books to now helping teachers. It’s almost like you were building different skills sets that allowed you to find eventually this thing that you love doing and want to do. Would that be correct? Mandy Rice: 04:16 Yes. And I thought about this a lot here and there of, “Oh, I never should have sold the makeup, or I never should have bought in and sold the books.” But really I wouldn’t be confident in what I’m doing now if I hadn’t tried those first. Lisa Linfield: 04:33 And that’s amazing to me because you know, when I teach the side hustle, everyone is always so focused on having the perfect product to sell or the perfect course to sell or the perfect idea. And I keep trying to say to them, “Hey, you know what, it doesn’t matter what you do, just start with something because there’s a whole bunch of skill sets you need to learn that it actually doesn’t matter what you do, you will learn them through any side hustle.” And one of them is how do you prioritize your day? You know, because here you are teaching every single day, it doesn’t matter whether it’s makeup, whether it’s books or whether it’s now your passion, which is helping teachers. You had to learn the skill of fitting it in with three kids and the day job. Mandy Rice: 05:19 Yes. Yup, you’re exactly right. Lisa Linfield: 05:22 Has that evolved over time? Have you come to do coping mechanisms to kind of build that skillset of time prioritization and starting to understand marketing and things like that? Mandy Rice: 05:32 Yeah, totally. And I think the biggest thing for me has been that I found something that really sets me on fire, I guess you could say, that I’m really passionate about. And so getting up at 4:00 or 5:00 AM some days because I’m really liking what I’m working on our … “Oh, I really want to get this done,” is not a drain, that’s not a burden, it’s something that I’m really motivated to do or, “I’m going to stay up an hour later tonight or I’m going to stay a little bit longer at work just so that I can get this done.” You know, like those little decisions finding balance, but also it’s not a burden because I’m passionate about it. So that does help. Lisa Linfield: 06:15 Absolutely. I’m giggling because literally three weeks ago this podcast episode was on the energy that never dies, and it is when people say, “How do you find the energy amongst your day job to work on your business?” If you’re passionate about it, it does generate itself, it keeps going. And just when you think I’m going to throw in the towel, someone you’ve served or helped somewhere stands up and says, “Hey, you know, you’ve really changed my life,” and it just always seems to come when you’re about to throw in the towel and then it re-energizes you to keep going and keep moving. Mandy Rice: 06:48 It really does because I mean that’s what it’s about, at least for me, it’s not about necessarily the side hustle of it, it’s reaching the people, right? It’s reaching people and knowing that you can bring some value to their lives. And just going back to kind of like this passion and what makes you get up early or stay up late or whatever it is, it doesn’t have to be exactly what you’re doing that just lights you on fire that you’re so passionate about. If you just get started, you’ll find that because for me it wasn’t necessarily the yellow brick road, and it was so obvious what I wanted to do. For me, my why was finding more balance in my life. I’m blessed to be a teacher and I love teaching, it’s definitely where my heart is but I also have a family that’s very young right now, and the hours of teaching and the emotional and physical and mental drain of teaching that comes in the school year. I have really had to come to grips with and balancing that. And so my why in a side hustle has also been to try and see if there’s options that allow me to have an impact in people’s lives in the education realm, but also allow me to be with my kids, present for their daily lives, not just in the evenings and weekends. Lisa Linfield: 08:07 And that’s huge. I mean, you have to have that why because it is hard and it does take extra hours and sometimes pushing through when you just want to press that snooze button. Mandy Rice: 08:18 Yes, yes. I don’t want to say that being a teacher, working 9:00 to 5:00 or whatever it is means that you’re not like a fantastic mother or parent, I don’t mean that at all. But I do mean that we’re all different, right? We’re all different moms, we all have different desires and we all have different definitions of what balance is. And so my why is kind of two pronged in reaching and helping teachers but also allowing me to do that well while showing up for my kids in their daily lives. Lisa Linfield: 08:49 I always say passion becomes purpose when you can do the thing that you love and that meets your needs, et cetera. And the purpose part of it is, as it starts to serve other people and their needs where what you were created to do, which is to be a fantastic teacher and you’re passionate about it, can then go on to serve other teachers to help them in their daily life, in things that you find quite natural and conserve them well with. Mandy Rice: 09:16 Yes, definitely. Lisa Linfield: 09:17 So tell us, how did you discover that you wanted to serve other teachers, that eventually at the beginning of this year became your new kind of brand and launched your site and all of that, what was that journey? Mandy Rice: 09:30 So I had our third baby last January, so it’s January in 2018 and took a quite extended maternity leave. In the states, we have 12 weeks unpaid, but we have 12 weeks where they’ll hold your job but my school was willing to give me the rest of the school year off. So I had a good eight or nine months period of just being home with my kids. But it sounds so silly, but I got on Instagram, I made an Instagram account for the first time I guess that was probably in like March. So a couple of months after having the baby and I made it strictly for teaching, so I was following other teachers and I was just reinvigorated in my passion for teaching and seeing other teachers and doing all of these great things. And I just was kind of following along and look marketing all kinds of things and saving things and ideas. I already had at the time in a YouTube channel with a pretty decent following because I had flipped my classroom. And so I had a ton of teachers and students already following me, and so I’m just kind of building off of that and recognizing over the last few months that people are listening, and people want to hear what I have to say in the space of education. Lisa Linfield: 11:24 So what, for those of us that don’t know, is a flipped classroom? And that homework is practicing with the content with the material, the vocab words, the reading, whatever that is, while the flipped classroom flips that. So what the teacher does is either creates or finds, I advocate that they create it, that’s what my online course, which I’m sure we’ll talk about, we’ll get to you. But the teacher creates a video of them giving that instruction, that direct instruction of here’s what you need to know. Students watch that either at home or maybe like in a station in the classroom for like our younger ones. And then in the classroom they’re doing what was traditionally homework, which is the guided practice piece, right? So in like a math class, they’re doing their worksheet or their textbook questions and practicing their formulas and stuff like that. And the idea is that in that practice, that’s where you want a teacher present, that’s where you want your classmates present. So you can ask them questions and so your teacher can say, “Wait, wait, you made a mistake on that one, let’s look at how you can make that better,” because that’s more genuine right now learning, if that makes sense rather than just sage on the stage delivering content, teachers are now able to work with students on what they need to know. Lisa Linfield: 13:24 So you’ve been doing this for 10 years, what has changed in the outcomes in terms of the courses that you teach? So I’m going to get kind of technical here, but like I said, a passing on the AP exam is a three, so when I didn’t flip, most of my students were getting three’s, some of them got four’s, maybe one of them got five, a lot of them are getting two’s, not even passing. When I flipped my classroom, every single one of my students except for two of them got a three, four or a five. Mandy Rice: 14:35 Every single one. So that my most recent year, ’cause like I said, I took most of the year off last year. So this was two years ago, I believe it was 85% of my students got a four or a five. Lisa Linfield: 14:48 Wow. That’s amazing. Mandy Rice: 14:49 Not even just passing, yes, yes. So huge results. Lisa Linfield: 14:54 In most cases, specifically because you’re in the older classes, do they actually watch the videos at home? Mandy Rice: 15:01 Yes. So I have a couple of advantages, so they’re 16, 17, 18-year-old students and they made the choice to take the advanced placement class. So I have those really huge influencers on the kind of what makes up my classroom. So yes, they do watch those at home, I try to keep the videos no longer than 20 minutes and they don’t have one every night, it’s probably every two nights. Lisa Linfield: 15:29 And then they come back to school and do the homework with you. Lisa Linfield: 16:08 That’s amazing. Mandy Rice: 16:11 You get into education because you want to work with students, but you can’t then undervalued direct instruction. So the flipped classroom is really just expanding the impact or the role of the teacher in a way that’s then manageable for their life as well. When I was flipping, I hadn’t quite had children yet but I did within two years of flipping. And I have to say that it’s what allowed me to continue having an impact on my students’ scores while having a family. Lisa Linfield: 16:43 Do you flip your American history? Mandy Rice: 16:45 So we do, it’s more blended with American history. So it is a graduation requirement class. So students in that class don’t choose to take it, which is a huge difference in the culture of your classroom, the different classes that you have but they do watch videos and what I will do is it’ll be no more than 15 minutes, I try to shoot for a 10-minute video that they’ll watch one every two to three days, it’s not that often, but that’s their direct instruction. And then we have activities working with that information. So they don’t watch it at home, they watch it in the classroom. And there’s many reasons for that, one is mostly because they won’t do it and there’s lots of reasons for that, like they don’t have access at home, they’re working at night, they’re taking care of brother or sister or nieces or nephews at night, the list could go on there. I can optimize my 15 minutes of a class period with those students by flipping within my classroom and not assigning as homework, if that makes sense. Lisa Linfield: 17:46 And you know, one of the things that I love about the concept of having the actual lesson itself recorded is, if you think about people’s learning and ability to learn, some people are auditory, some people are writers, some people are visual, et cetera, but at least they can watch it again two or three times so they can watch it in revision at the end of the year before the big exam. It’s not like that amazing piece of kind of knowledge importation is lost because it’s always real time. And as you say, then the practice is what you guys focus on together. Mandy Rice: 18:18 Mm-hmm (affirmative), you’re exactly right. And it’s funny that you say that. So at the beginning of the school year, each year it’s a newer concept for most, not all students because it’s been around a little more, especially in our building there’s more teachers doing it but I teach them how to take notes. It takes a little bit of time, but I teach them how to take flipped notes from a video and I kind of tell them the story. Have you ever wished when you’re sitting in your classroom and your teacher is lecturing, they’re giving their lesson and you just need them to stop for a second? You just want to like tell your teacher, “Shut up,” but you can’t do that because you don’t tell your teacher to shut up. But you need them to slow down, right? Well, now you can and even tell my students, “You know what, if you want to tell me to shush, I want you to like push that pause button, say shush Mrs. Rice, because I don’t want you writing while you’re listening.” If you are writing something, I don’t want you also listening because you’re gonna miss something. So there’s so much power in pause and that’s just one of the lessons that I teach them that you can pause your teacher and especially think of your students who have like a learning disability or auditory issues, like that is so huge for them because there’s no embarrassment in slowing down. There’s no embarrassment in needing your teacher to pause for a minute. Lisa Linfield: 19:46 And also not only to pause for a minute, but also that ability to then repeat what they say, you know? Mandy Rice: 19:53 Yes, yes, exactly. Like rewind it, you didn’t get it, rewind it, and there’s so much skill. It’s that metacognition, the understanding of your thinking, it’s knowing what you know, it’s knowing what you don’t know. And for a 15-year-old, 10th grade in American history, they’re just learning essentially how to learn, especially in a high school setting. And so having that understanding of, wait, she just said something and I missed it. That is so huge. That is such a, what we call a soft skill, right? It’s such a skill that is going to have such an impact on the rest of their lives, and I’m not necessarily doing a whole days lesson on it. It’s just in the processes and procedures of my classroom, they’re learning it because of those. Lisa Linfield: 20:39 And I think it’s fantastic that you teach them how to take notes, because there’s so much we take for granted as adults that if we had have known it at school, it would have equipped us a lot better. How to take good notes, there is a lot more available on how to study. But this last weekend my daughter who’s 11 and she was struggling with keeping everything organized because there’s kind of quite a steep change. And I went and researched bullet journaling because they are still very tactile in writing, and then taught her how to make to-do-lists and things like that. And it’s just a skill we as adults take for granted, and you saying, “Well you shouldn’t be writing and listening at the same time.” I mean my instinctive reaction was, “Well how else did you take notes?” Because the teacher’s sitting up there and you can’t say to the teacher, “Okay, hold on, I just need to catch up.” It’s such a thing we all had to do, which was to write and take notes and then maybe you did miss half of the stuff. Mandy Rice: 21:38 Yup. You’re exactly right. To me the flipped classroom is, it’s not an answer for everything, nothing in education is an answer for everything in the outside influences on a child’s life, but it certainly meets a lot of needs for a lot of different students. And frankly, and this is kind of where I come in, at least in my clients and the teachers that I’m helping, it really makes the difference in a teacher’s life too. Lisa Linfield: 22:03 No, absolutely. And also, I mean, once you’ve recorded it once, you don’t need to record that lesson again. Obviously, I mean you can change it and update it, but there comes a point where you’ve got a whole file load of amazing content. Mandy Rice: 22:15 Yes, you’re exactly right. Yeah, and I’m sure you know this, like eventually you’re going to want to add something to a video or change something of course but you don’t have to. You still see those students every day in class and you can talk to them about it then that there’s so many possibilities there. Lisa Linfield: 22:32 So you started off kind of building a following of teachers who were interested in what you had to offer specifically around AP psychology in this flipped classroom, and you put all your content on a thing called TPT. What is that? Mandy Rice: 22:48 So Teachers Pay Teachers is a website, I am not quite sure how long it’s been around, I want to save for at least 10 years now. But it’s where teachers, when they’re making materials for their classroom, they can put it in PDF form or other formats but that’s a popular one. Put it up on Teachers Pay Teachers, set a price for it and other teachers can purchase those materials. So the idea of being, it’s print ready and go, so that you can be in your classroom doing great things without spending so much of your afternoon, your evening, your weekends, creating those things. Lisa Linfield: 23:28 I mean, I looked at that and went, geez, if I was a teacher, I would be buying your stuff in two seconds because you know, I might have a passion for teaching but your stuff is beautiful and you’ve clearly put a huge amount of effort in, which is I guess what makes it popular. But is it one of those things that kind of, you have this website for teachers and you pop your stuff on and it sells like hotcakes and off you go? Mandy Rice: 23:52 So kind of, there’s riches in the niches, right? I really niched it down. Teachers Pay Teachers is really popular for the lower level grades because they need manipulatives in almost everything that they do and there’s a lot of possibilities there. Elementary teachers are teaching all of the things, all of the subjects, whereas I’m just teaching one maybe two in the high school setting. And in the teaching world, that is such a world changer in not necessarily a great way, because then that could happen every year. So that means that a teacher is reinventing the wheel every single year and they’re not at their peak of performance for their students, for themselves, for their families. It really can be draining. I started teaching psychology when I first started teaching, but the last time I took psychology was two to three years prior to that in an education site class, and that was the only psychology class I took in college yet, I’m certified to teach it. That doesn’t mean that I can’t be great at it because my foundation is in teaching, not necessarily the subjects, and like American history for instance. So I started teaching that for the first time last year, I haven’t taken a history course since college and I graduated in 2009. So content is not king, that’s kind of like a phrase in education is content king. No, it’s not, it’s building relationships that’s reaching students. But when you have a new content in the high school level and you’re spending so much time having to learn that and create it, you’re definitely sacrificing those relationships with kids. And so that’s why I love Teachers Pay Teachers. It’s for teachers who have invested a lot of their time, energy and talents and skills into creating curriculum, creating resources so that other teachers don’t have to do that but they still have quality resources so that they can focus on reaching their students. Lisa Linfield: 26:23 And I totally agree with you. I mean, you can have three teachers teaching the exact same content and your child will respond completely different to that content. The content is almost the price of doing business, the differentiator is reaching all those different learning styles and personalities and things like that, that you have to do as a teacher. Mandy Rice: 26:45 Yes, exactly. Lisa Linfield: 26:46 So you put your stuff out there on Teachers Pay Teachers, and you’ve started to build a library and now you have this Instagram account that you kind of learning about. There’s a large element of sales and marketing that nobody taught you as a teacher. How have you equipped yourself with all of this? I mean, I know even I work with my niece who is young at university and she helps me on some of the stuff in my business. And we falsely make the conclusion that because young people use social media and other digital channels a lot, that they naturally understand how to use it as a marketing tool, which is completely incorrect, you know? So you’ve come, you’re a fantastic teacher, you’ve got amazing worksheets and things. How have you equipped yourself to help other teachers know that you’ve got all of this stuff available? Mandy Rice: 27:40 That’s a really good question. The short answer is that I’m really learning as I go, I really am because I’m really blessed that I come from a teaching background. And for me at least in my personal journey in education is it’s reaching the students and having their buy in, which really is building a community, right? Mandy Rice: 28:03 And that’s essentially what marketing is. Marketing is building a following, it’s building a community of people, like-minded folks who want to hear what you have to say. But that doesn’t mean that I’m good on the technological side of it or the social media side of it, if that makes sense. I can build relationships but that doesn’t mean people are knocking on my door asking for me to have a relationship with them. So really it’s been quite a few things, I’ve found a few people on Instagram in the education world that are doing similar things and I followed them and learned from them. But then the other one is podcast actually I have about a 30-minute commute to and from work. So I get at least one podcast in a day or part of one. I follow quite a few online marketing specific podcasts and business building podcasts that are really, really changing things for me and teaching me some really great stuff. Lisa Linfield: 29:01 And now you’ve done your flipped classroom for a while, you’ve got your Teachers Paying Teachers, you kind of really building this business, you’ve launched your own blog and things like that. You mentioned earlier on in the interview that you were thinking about launching a course on teaching other teachers how to do flipped classrooms. How did that come as almost a next step in your journey? Mandy Rice: 29:23 Yeah, so there’s always other opportunities in education within the building that you are teaching in professional development and working with other teachers and I’ve always been involved with that, I’ve been involved on the technology side of integrating technology into the classroom. And so I have always been working with teachers and I’ve always liked it. It kind of had to take a back seat as I was having three children and building our little family, but then once I got back into the classroom and [go to 00:29:54] Instagram my account and really started answering emails from other teachers based off of my YouTube channel. I realized, “Wow, I really like working with other teachers.” And so as I’m listening to a podcast and online marketing and that kind of stuff, there’s this idea planted in my brain about building an online course. And at the time I just saw it as, “Oh, you know, that’s what they do in the business world. I’m not in the business world. I’m in education.” And then I started thinking, “Hang on a second. Our school districts, our counties, our districts, whatever, they spend so much money on professional development for their teachers and they should. Like the biggest impact on a student’s life are the teachers, and that’s where districts need to be spending their monies empowering those teachers. So who’s to say that I don’t have something to contribute to that market and to that space of professionally developing other teachers. And so I just have started running with it, I think that other school districts would be interested, I know other teachers would be interested and so I’m going to see what I can do. Lisa Linfield: 31:02 How have you started? So you’re in your car commuting, you think, “My goodness, this is a great thing I’m going to build a course on flipped classrooms,” and there’s a hang of a gap between that thought and launching this thing, have you gone about teaching yourself how to do this? Mandy Rice: 31:16 Yeah, so I’m taking a course, one of the podcasts that I listen to is Amy Porterfield’s on Online Marketing Made Easy and so I recently purchased her digital course academy and she’s kind of walking me through really the technological side of how to build a course, because I have an advantage because I teach for a living, right? So I know how to teach people and really I know how to teach online. I’ve built an online course before it just was in a platform that my school district had, I just haven’t had it on the business side of things and the whole marketing thing. And so I am taking the course, I’m not completely up-to-date on where they are, I think they’re on like module seven and I am starting module five but that’s okay. So yeah, I find time where I can, I’m on spring break right now so I’m taking advantage of that. But also getting time in with my kids, I’ve got to leave here in about an hour to go pick them up from school. I’m really thankful because I’ve made videos before, I’ve taught people before even in the online space, it’s just been students, right? Mandy Rice: 32:20 Like teenagers. Now it’s adults and it makes it a little different but it’s really the same, like you’re teaching people. Lisa Linfield: 32:28 No, absolutely. I mean, the thing I love about your approach is to say, “Hey, this is a module I have in something I think I can do.” So what I’m gonna do is go out and find who can teach me this in a way that will fast track me not having to stop my turn and work it all out for myself. So you got a course to teach you how to build this thing. Ironically, a course to teach you how to build courses. So when you step back and you’re in Lala Land where the laws of gravity don’t apply and your biggest and best dreams come true. How do you see the path that you’re on? So you’re about to launch in June, you’re going to launch your first course. How do you see this whole almost side hustle? How do you see it evolving? Mandy Rice: 33:13 Oh, that’s a big question. I do have big aspirations, it is tricky for me personally to kind of put those on paper to say those out loud because I think, “Oh man, now I really have to do it.” But there’s also this part of me and education that is almost like forcing me to think small, but then the other part of my brain comes in and says, “Stop that. Don’t do that because you could have a bigger impact and that’s okay.” So Lala land, big dreaming would be that I am working with more teachers, I’m speaking in front of teachers, and that I’m really advocating for an empowering teachers. And that can look like a lot of different things, a big passion that I have that we haven’t talked a lot about in this space is empowering and advocating for teachers in the space of maintaining themselves while showing up for their students. I think a lot of times in our culture and society today, teachers are martyrs and I don’t necessarily say that in a positive or negative way. I mean, it’s definitely positive because teachers are sacrificing so much every day for students who are not their children and I see this on social media all the time. I lose sleep over kids who are not my own. But I think there’s too much sacrifice sometimes in that martyrdom, there’s too much that teachers are having to give up and I think that’s why we have such high attrition, I forget the percentage, but I want to say like one in five teachers leave in the first five years of teaching, it’s probably even higher than that. And so I want to advocate for that because that’s also advocating for students. Lisa Linfield: 35:06 Absolutely. And you know Mandy, I’ve learned in my journey that all of these feeds off itself, there’s no care borders of stop and start. You can absolutely start in your niche but you know I love the fact that your Lala Land is the essence of what you’re trying to achieve. So your Lala Land is not I’m going to teach flipped classrooms to every human being. Your Lala Land is I’m going to serve teachers and I’m going to serve them in the areas that matter most, which is content, for example, one piece of content is a flipped classroom, there’s only one aspect of it. There are multiple things of being a great teacher. Flipped classroom is a tool and something but also there is how do you help them to energize themselves and to protect their own energy and to maintain their passion and purpose that got them to come in, in the first place. I mean, the most influential part obviously besides a parent in a child’s life is their teaching system and their teachers. So healthy teachers will have healthier kids and so I think that’s wonderful and I find even in my own business I have Working Women’s Wealth, which is my passion is to teach people about money. But my day job is to manage a wealth management business and there are symbiotic in their worlds and in their content. The things I learned from my clients is what I teach others to not do and vice versa. The things I learned and what I teach, I also extend to my clients and it is about this symbiosis of when you are really focused on the people you serve as opposed to the particular content, there is so much opportunity for you and it’s definitely a space in terms of nurturing our teachers and giving them the tools they need, be at personal tools would be at content tools that I’m so glad you’re tackling it. And what I love about you doing an online course about it from a selfish perspective is that, it’s not just limited to people in America, people in South Africa could buy your course, my listeners in America or in the UK or Australia can buy the course. It allows you to take best of breed and give it to whomever is keen and needs to learn it. Mandy Rice: 37:14 Yeah, I’m really excited by that aspect actually, because you know, I’ve been in my own little bubble here in America and there are teachers all over the globe. Right? Lisa Linfield: 37:24 Absolutely, I mean I know the teachers in our schools here in South Africa do flipped classrooms as well and are just starting it. So access to your types of resources would be fantastic. So how would people follow you or learn more about your worksheets, your courses, and when you launch the flipped classroom course in June, how would they be able to be following you so that they can get access to it? Mandy Rice: 37:47 Yes. So the biggest one is probably on Instagram on Teach On A Mission, but I also am working on building my website so it’s there, it’s just not fantastic right now. So it’s www.teachonamission.com. And so between Instagram and my website, that’s where a lot of things will be kind of launching from. I have a page on Facebook under the same name. So yeah, I’m trying to tackle multiple platforms but the big one right now that I’m trying to focus on is building up that website and building the course. It’s kind of goes hand in hand there. Lisa Linfield: 38:24 I think that’s fantastic and I wish you so much good luck and strength and energy and a whole hood of braveness in your journey. And I think that what you’re doing is going to meet such an amazing lead in the world not just in America, and I hope and pray that there is so much success for you. So thank you so much for joining us. Mandy Rice: 38:44 I really appreciate that. Thanks so much. Lisa Linfield: 38:46 All right, take care. That was Mandy Rice. And as you can tell, I really enjoyed that interview, I am passionate about teachers. I personally could not teach kids, it’s not my gift. And so I think that the teachers of the world who invest in our kids and find ways to equip other teachers and energize them, amazing, incredible human beings. And I love her story on this, is that she is looking to start and take those steps to build a business that serves other teachers. And it is something that I think is a story that everybody I speak to shares, it’s not a straight line. You start with one thing, she had her makeup and then you kind of work and you find a rhythm and you find what it is that you want to do. That not only helps your passion but also has immense purpose in it of supporting other teachers. So if you’re a teacher, I definitely recommend following her and seeing her course which launches in June. And for those of you who aren’t, I hope that this has just been an inspiring insight into the changing world of education and how teachers are starting to earn extra income, because they are not the highest paid profession for the enormous important job they do. So take care everyone. Have a great week. I’m Lisa Linfield and this is Working Women’s Wealth.